There is a great article over at The Economist that highlights the common causes of clutter that slow businesses down. These are a few of quotes that jumped out at me. Clutter is taking a toll on both morale and productivity. Teresa Amabile of Harvard Business School studied the daily routines of more than 230 people who work on projects that require creativity. As might have been expected, she found that their ability to think creatively fell markedly if their working days were punctuated with meetings. They did far better if left to focus on their projects without interruption for a large chunk of the day, and had to collaborate with no more than one colleague. The best way to institutionalise decluttering is to force managers to justify any bureaucracy they introduce. Seagate Technology, a data-storage company, and Boeing, an aircraft-maker, both hold their executives accountable for the “organisational load” that they impose on their subordinates in terms of meetings, memos and initiatives, and measure them against their peers. As Bain points out, the most valuable resource that many companies have is the time of their employees. And yet they are typically far less professional about managing that time than they are at managing their financial assets. User experience is an individuals subjective opinion of a product. This opinion is based on how well the product supports the individuals needs and meets their expectations. Everything has a user experience. No two people are alike and no two experiences of a product are the same. Every day brings with it new life experiences that shape who we are and what we expect from a product. This causes the user experience to be dynamic. Individuals form new expectations of the product based on their experience using other products. Even if the product stays the same its user experience changes. Every aspect of every interaction the individual has with the product shapes their opinion of it. When we improve the UI we are only improving at most one aspect of the holistic experience. It is possible to have a product that looks great but provides a terrible user experience. The success or failure of the user experience is the responsibility of the entire organisation. User experience is not about the product, its about people who use it. A good user experience is one that meets the individuals needs and expectations. A great user experience exceeds them. User Experience is a commitment to developing products and services with purpose, compassion, and integrity. It is the never-ending process of seeing the world from the customers’ perspective and working to improve the quality of their lives. It is the never-ending process of maintaining the health of the business and finding new ways to help it grow sustainably. It is the perfect balance between making money and making meaning. The User Experience Designers job is not to create the user experience. Instead it is to facilitate the creation of a great experience through the process of User Experience Design. The User Experience Designer brings to the organisation tools and activities to enable a more collaborative and transparent way of working. We conduct research to identify problems. We help the business to understand itself and its users. We challenge assumptions and break down silos. We use design thinking to facilitate the creation of solutions, and we validate that those solutions work in the real world. The goal of a UX designer is to make users effective. Our job is one of understanding, facilitation, creation and education. We provide the organisation with a sustainable competitive advantage. If you’ve got a project and you’re running over budget or times are tight you can always look at something like user experience and say well let’s cut that out. I mean it’s a cost, right? It was a cost but I think it created savings on the other end. I mean I think we ended up with something that’s not going to have to go back multiple times and be tweaked and adjusted and fixed. I think by the time the project is done it’s going to have something really usable as opposed to something that will just get us by, that will deliver the service. Those that spend the most effort in search of shortcuts are often the most disappointed and the least successful. Design principles describe to the world who we are. They allow employees to consistently and meaningfully represent themselves by acting as a theme that runs through everything the business does, creating an experience that transcends departmental silos. Creating these principles is certainly a job the design team can assist with, but they cant just hide themselves away and do it in isolation. The foundations upon which these principles are built go deeper into the business than any one team. They belong to everybody and should manifest themselves in everything the business does, they need to be part of employees daily lives and by creating them together there is a much greater chance of success. Standing for something isn’t just about writing it down. It’s about believing it and living it. This post describes how we used the KJ-Technique to uncover the foundations on which we could build a set of design principles that an entire business could believe in and get behind. The KJ-Technique is a priority setting technique that involves focusing on a single question. Its easiest but most fundamental step is to decide what this question should be. 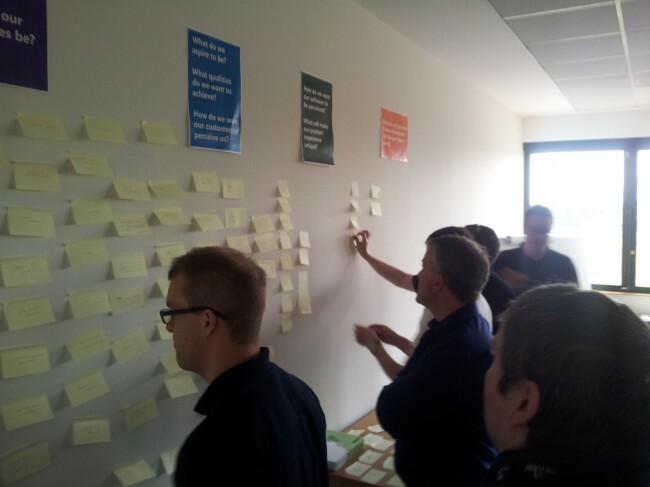 To get the most out of the workshop we needed to maximise buy-in and get as many different perspectives as possible. This meant convincing as many people from as many parts of the business as possible to attend. This is a much easier sell if you only schedule in an hour for the workshop, time keeping is tough but we found it was enough time. The invite should explain what design principles are, communicate the impact they will have on peoples working lives and get people thinking about suggestions they might like to put forward. Here is a copy of the meeting invite that I sent. Not everyone will be interested in attending the workshop, but more fool them because these principles are going to be used to judge everything the business does from here on out and this is their opportunity to input into them and to control their own destiny. I thought it would be helpful to prepare the room to inspire people and keep the session focused, these are the posters I put up. I found it helpful to gave a short presentation to kick things off and set the tone for the workshop. This should leave you with a prioritised list of groups which encapsulate the essence of each principle. As well as a cluster of items that belong to each group which will help to describe and provide context for the principle that group represents. These groups are what the business cares about and are the foundations upon which you can build your design principles. You can now wrap up the workshop by telling people that now we have established what we want to be we can begin to move towards it. This is a good point to briefly describe what the next steps are to help to set expectations; for us this was for the design team to flesh out and publish the design principles and formalising a framework that enables employees to make the design principles part of their working lives.